So here I am, the pumpkin beer skeptic posting another review of a pumpkin beer. Why? Because this one's too damn good not to share. I don't have an immense amount of details to share because it's a simple yet blissful experience. 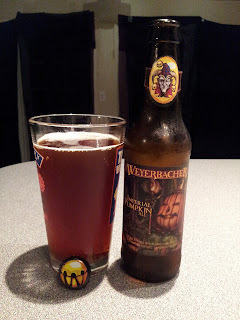 You may have noticed that I haven't posted many reviews of pumpkin beers. I tried quite a few, but felt they weren't worth reviewing. It's not really in my nature to waste anybody's time just to say "you probably shouldn't buy this," so despite my previous promise to share my favorite pumpkin beers, there just haven't been that many. 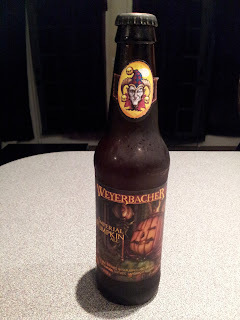 Despite my aversion for the style, it's safe to say that Weyerbacher pretty much always impress me with their commitment to brewing some of the highest quality craft beers I've had the pleasure of tasting. This partcular beer is a bit on the bitter side, but that's where I prefer my drinks anyway. The dominant flavor here is cloves rather than the sweeter cinnamon and nutmeg which overwhelm most other pumpkin inspired beers. 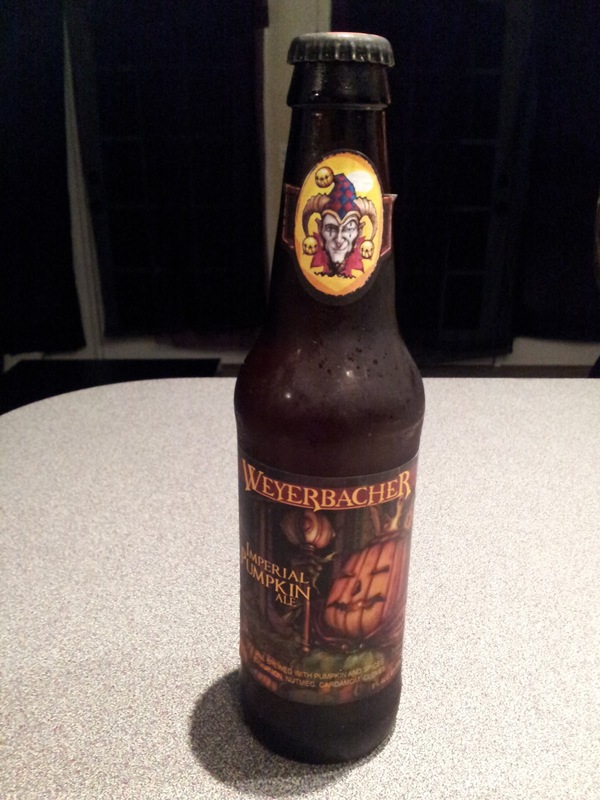 This beauty pours a thick amber colored body, with a moderate but not extreme head. The scent is appropriately autumnal: slightly spiced and slightly sweet. Drinking this beer evokes more than just pumpkin in my mind. I remember the chilly autumn afternoons when I used to smell the fallen leaves. I smell and taste autumn as a whole in this beer. It's the summary of the smells and tastes of the season with an emphasis on the pumpkin pie that brought the whole family together. If there's any one pumpkin beer you try this year, be sure to give that honor to this delicious treat. As this is a seasonal ale, I seriously recommend you grab yourself a bottle or a pack of it now. While the price might decrease after the month or season end, it's more likely that the stores will be out of stock before this beer's run is over. It's that good. Get it now and impress your friends with your stunningly good taste.